The largest and most complete Extinct Saltwater American Crocodile Gavialosuchus Skull was discovered in the central Florida Phosphate Mines, of the Bone Valley area (Polk County), near Tampa, Florida, in 1990. 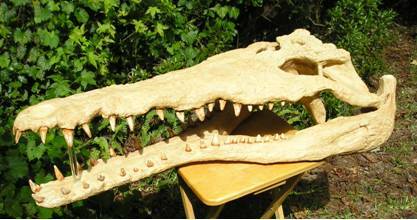 This Ancient Crocodile is from the Late Miocene Period and dated to an age of 5-7 Million Years Old. This Skull measured 52 inches (132cm) in length and about 19 inches wide. It was a well-adapted skull for aquatic life that could stick just its snout out of the water to breath. These Giant Prehistoric Crocodiles of Florida had a body length estimated to have been 31 feet (9.5M) and weighing in at 8800 lbs. or 4.4 US tons. 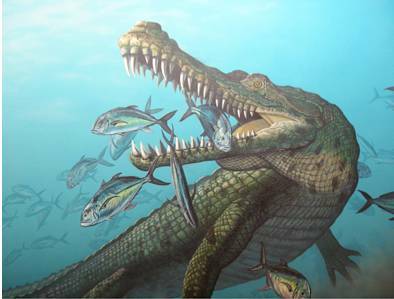 Thought to be fast swimmers, these long-snouted crocodiles were mainly fish eaters. Their crocodilian teeth were long and cone-shaped with a slight curve to them. 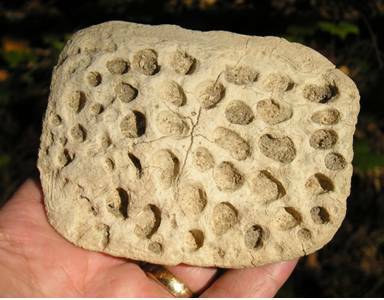 Crocodile osteoderms, or scutes, differ from Alligator Scutes, mainly in the fact that Crocodile scutes have no central ridge on them. Teeth, vertebrae and osteoderms are the most common fossils found of Crocodilians, in Florida. Today, only one living species of Crocodile can be found in the United States. It is Crocodylus acutus and it lives at the southern most part, of Florida, in mangrove forests.